The speciality of Daimon High. ...when discord strikes Daimon High. ...but that isn't it for the Daimon High Martial Arts Championship! ...are run and maintained by the K-Fight Executive committee!" - Keiichiro Nagumo is the creator and champion of K-Fights. - Ryoko Mitsurugi is the current K-Fight champion and won over 46 battles in a row without losing one. 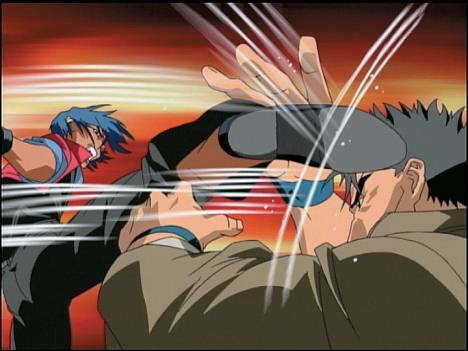 - Shizuma was able to transfer to Daimon High with a full scholarship by becoming first place in the martial arts tournament at the Daimon High festival. - During Ryoko's & Shizuma's rematch, Keiichiro Nagumo appeared for the first time (since his days at Daimon High) to challenge Shizuma and defeated the "mountain monkey". -Ryoko Mitsurugi defeated both Azumi Kiribayashi & Shizuma Kusanagi in a K-Fight. -The "K" in K-Fight means kenka. 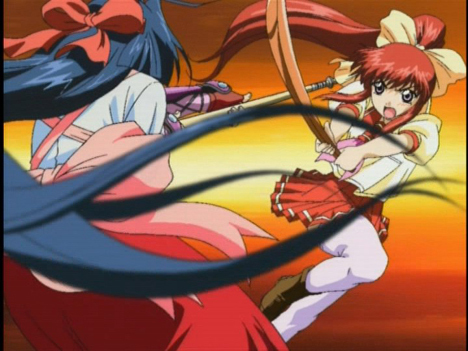 In Ryoko's & Azumi's rematch the "K" means kitchen (Episode 7).